There was some confusion as to whether or not this vessel belonged on our list. Part of the reason was we’d confused her with same-named (and similar-size) Oceanco belonging to a Middle Eastern head of state, and for the purposes of this list, we exclude yachts such as that. Confusion over, we now know that this Constellation has accommodations for 48 guests and is among the mega-size megayachts catering to corporate charters. 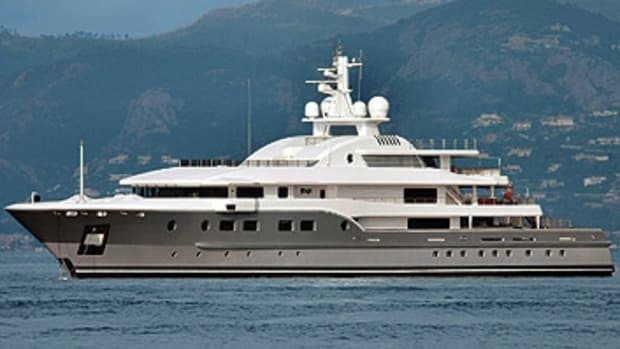 A few of her cool features: a 220-square-foot master suite (called the Chairman’s suite), complete with a private, direct-dial phone number; a real fireplace in her library; a beauty/massage salon; and a helipad that rises hydraulically from the top deck.